This beautiful site on the escarpment of the Chiltern Hills has been visited by Sonning Common Green Gym every month since we started. It has a mixture of flower-rich grassland, beech woodland and juniper scrub, with far-reaching views over the vale of Oxford. Parts of the Reserve have SSSI status, and are home to the Chiltern gentian, many species of orchids, spotted skipper and chalkhill blue butterflies and of course the Red Kite. 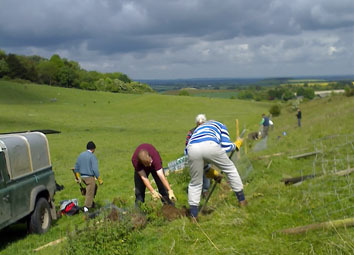 We undertake many different tasks at Aston Rowant according to the season: fence, stile and gate erection, scrub clearance, juniper planting, bench building, installation of explanatory boards, sheep herding, pond work, step construction and fence removal. The friendly wardens instruct us in the necessary skills, and in December we always have a scrub bashing session with a bonfire and spud roast. Bring a packed lunch, as all Aston Rowant sessions run from 9.30 to 2.30. Reserve Office, on Icknield Way, off A40. OS ref: SU726976, Click here for a map. Nature Reserve Car Park, off un-numbered road from BT Tower to Christmas Common, marked by a brown sign at turning. OS ref: SU731966, Click here for a map. Forestry Commission (Cowleaze) Car Park, between BT Tower and Christmas Common, marked by Green name boards. OS ref: SU726957, Click here for a map. Hill Road, near entrance to Hill Farm. OS ref: SU722968, Click here for a map.